We bought a private jet in June. I know you are wondering how someone who runs a family business of puzzle making could buy such an expensive and luxurious airplane. 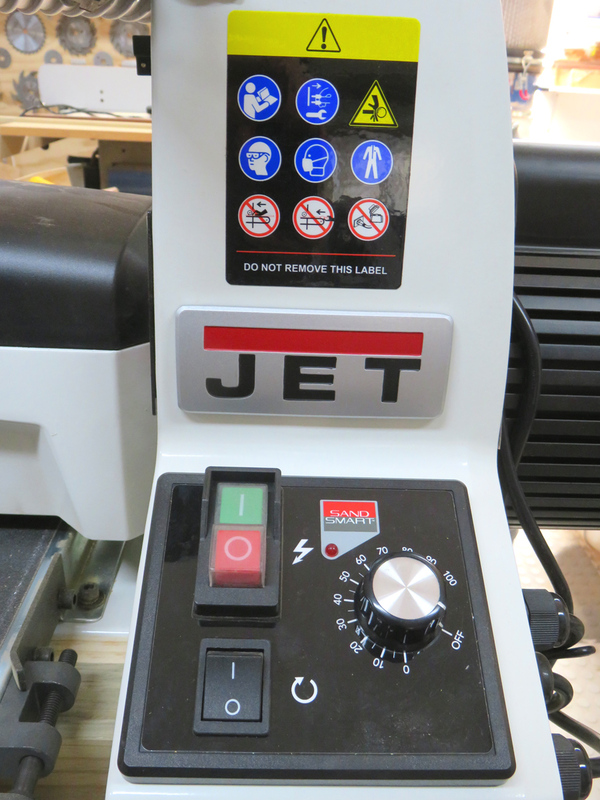 What we really bought is a product of JET company; drum sander JET JWDS-1836. It costs one thousandth of a private jet. 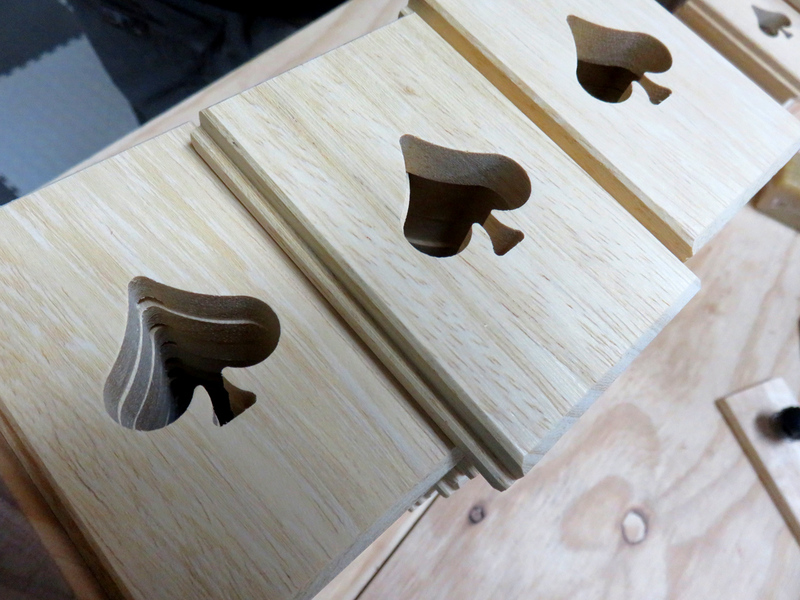 We have started using Burmese Teak since we produced Quartet Box. The timber is a gorgeous material, but it dulls the edge of the blades of our machinery tools, like the table saw, jointer and thicknesser. To change the blades of machines requires extra time and it costs dozens of dollars for the tungsten carbide blades of the thicknesser. So, Juno wanted to do something for the issue. In Australia, the end of June is a fiscal year-end. We have sold puzzles so-so this year and had money to spare to buy some new machinery. 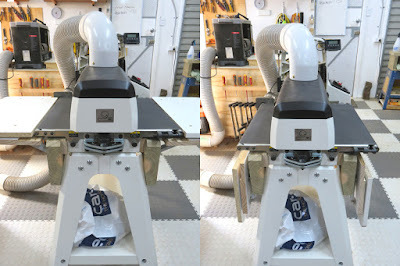 We thought we are going to need a drum sander in the future anyway and it might be a good idea to buy it now. Then we headed to our favorite shop, "Carbatec." Juno has done several customizing operations to the drum sander that we bought. We knew that a genuine product of an in/out feed table is sold, but it is not designed as folding, so it takes room when it is not in use. 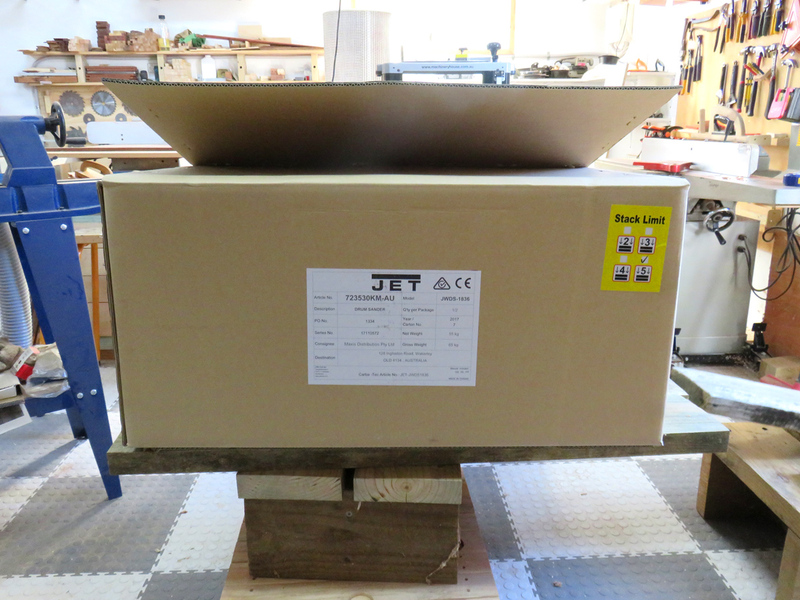 Juno bought L-shaped foldable brackets and made the in/out feed table which can be folded when it is not in use. 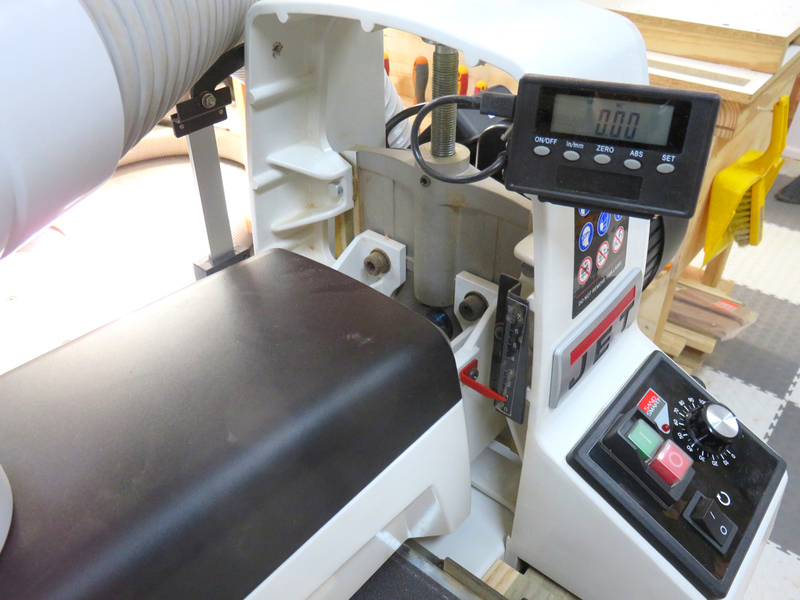 The height of the conveyor belt of the JET JWDS-1836 drum sander can be adjusted. Therefore, if the height of the conveyor belt has changed, there can be a step between the conveyor belt and the in/out feed table. Juno added an adjustment function to the in/out feed table, and made both the in/out feed table and the conveyor belt to be able to be the same level. When we make puzzles, we always pay attention to even under 0.1mm measurements. 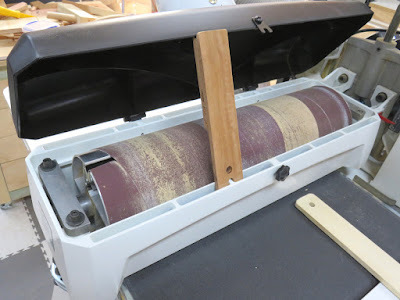 Even if Juno adjusts the drum sander very carefully, if the position where he put the timber through is different, the thickness of timber would be slightly varied. 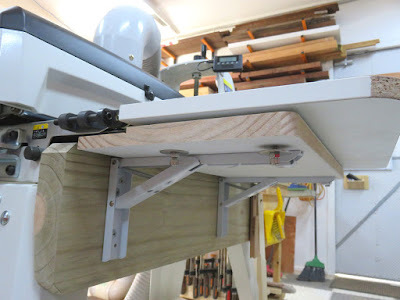 To avoid this issue, he made the T-shaped fence and made it adjustable to the in/out feed table. Letting timber go through along the fence, there would be almost no discrepancy of the thickness of the timber that comes out. Furthermore, the fence makes it easier to put through multiple timber butting their front and back ends to prevent snipe that usually occurs on both ends of the timber. He also attached the DRO (digital read out) to the drum sander. The DRO is helpful for fine adjustment for the height of the sanding head. 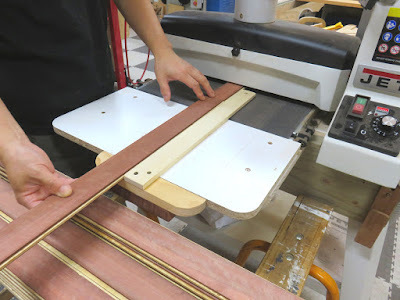 When he changes the sanding belt, the simple stick helps to keep the top cover open. To fix the top cover in a closed position, the star nob can be used that was changed from the original screw. 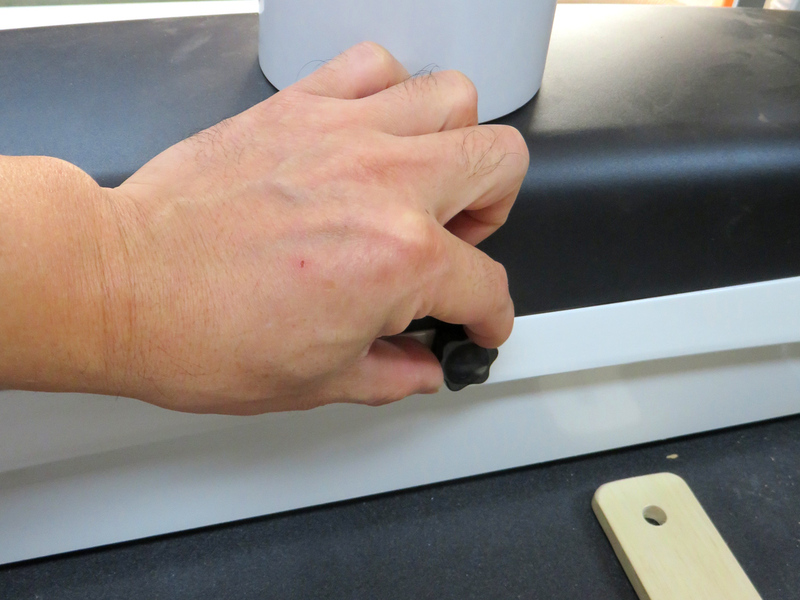 The star knob can be turned without using any tools and it is very convenient. These are using a little ingenuity, as each such customization contributes to increasing the efficiency of the work. 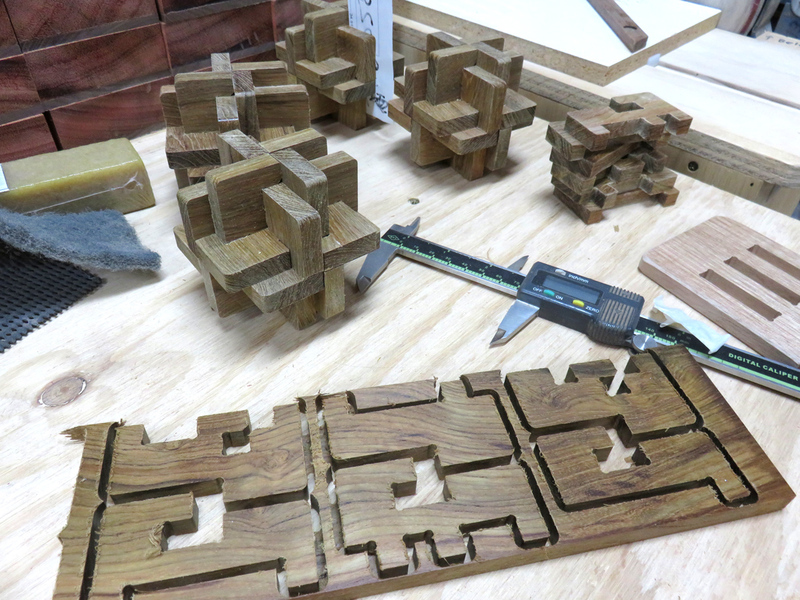 We are currently making three kinds of puzzles. The drum sander contributed significantly to produce those three puzzles. Our private jet cannot fly, we still love it very much. We assume that we can start selling our one or two new puzzles in October. We are working on them very hard almost every day. Please wait a little more until our unique puzzles are released.